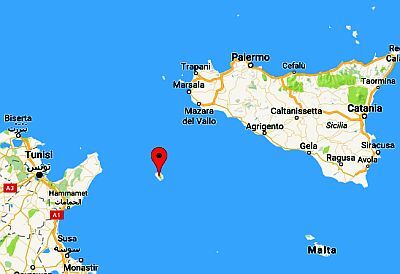 In Pantelleria, a volcanic island located between Sicily and Tunisia, the climate is Mediterranean: winters are mild and relatively rainy, with sunny periods, but also waves of bad weather characterized by wind and rain, while summers are hot and sunny, a bit stuffy, but tempered by the breeze. The daily average temperature ranges from 12 °C (53.5 °F) in January and February to 25.5 °C (78 °F) in August. The lowest recorded temperature in the winter months are slightly above freezing, the highest in the summer months are around 41/42 °C (106/108 °F). Although the temperature is generally mild, the wind, which blows especially in the cold half of the year, can increase the feeling of cold; in particular, the mistral (north-west wind) often blows from Sardinia, but there is also the sirocco (south wind), which blows from Africa, and can bring the desert sand. Owing to the southern position, cold waves from the continent are rare, and in any case, they do not last long. In the interior, there are elevations, which reach 836 meters (2,743 feet) in the Montagna Grande ("Big Mountain"). While in the plains it almost never snows, at higher altitudes it can sometimes snow. Here are the average temperatures recorded at the airport, which is located at 200 meters (650 feet) above sea level. Rainfall is not abundant, in fact it is around 500 millimeters (20 inches) per year, with a peak of 90 mm (3.5 in) in November, and a very pronounced minimum in summer, with less than 5 mm (0.2 in) from June to August. In spring, by May there is already little rain. The amount of sunshine in Pantelleria is excellent in summer, when clear skies prevail; in winter, sunny periods, which can occur in this season as well, alternate with cloudy periods. 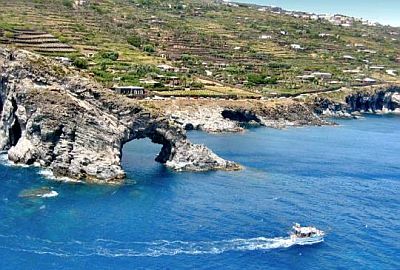 In Pantelleria, there are no beaches (except on the shores of the inland lake called "Mirror of Venus"), since the island is of volcanic origin: the coast is formed by cliffs overlooking the sea and caves, or by small bays where you can sunbathe, such as Bue Marino and Balata dei Turchi. The sea in Pantelleria is warm enough for swimming from July to September, as usually happens in the southern Italian seas. In June, the sea is still a little cool, while in October the water temperature is still decent, around 23 °C (73 °F). The best time to go to Pantelleria, for a holiday at the beach, is the summer, from June to August. The sea temperature is comfortable enough from July to September, although by September, which overall is still a good month (especially in the first half), the first disturbances begin to occur (although more rarely than in peninsular Italy because of the low latitude). In June, as I said the sea is still a little cool, while in May it is still cold, and sometimes the air too can be a bit cool for sunbathing (perhaps because of the wind). April and May are ideal for hiking, while in summer it can sometimes be too hot for outdoor activities (especially in July and August: in June and September the heat is usually pleasant or at least bearable, obviously when the sirocco does not blow). In October, temperatures are mild, but the days are shorter and the weather can be rainy and windy.